Callao Cave is one of the limestone caves located in the municipality of Peñablanca, Cagayan province, in the Philippines. The seven-chamber show cave is one of 300 caves that dot the area and the best known natural tourist attraction of the province. The town is named as Peñablanca for the presence of white limestone rocks in the area. Callao Cave is located in the Barangays of Magdalo and Quibal in Peñablanca about 24 km (15 mi) northeast of Tuguegarao City, the capital of the Province of Cagayan. Although the initial hypothesis of human migration to the Philippines proposed the use of land bridges during the last ice age, modern bathymetric readings of the Mindoro Strait and Sibutu Passage suggest that neither would have been fully closed (which correlates with the Philippines being biogeographically separated from Sundaland by the Wallace Line [note 1] ) and a sea crossing has always been necessary to reach Luzon and other oceanic islands of the Philippines. Henry Otley Beyer was an American anthropologist, who spent most of his adult life in the Philippines teaching Philippine indigenous culture. A.V.H. Hartendorp called Beyer the "Dean of Philippine ethnology, archaeology, and prehistory". There have been several models of early human migration to the Philippines. Since H. Otley Beyer first proposed his wave migration theory, numerous scholars have approached the question of how, when and why humans first came to the Philippines. A land bridge, in biogeography, is an isthmus or wider land connection between otherwise separate areas, over which animals and plants are able to cross and colonise new lands. A land bridge can be created by marine regression, in which sea levels fall, exposing shallow, previously submerged sections of continental shelf; or when new land is created by plate tectonics; or occasionally when the sea floor rises due to post-glacial rebound after an ice age. The small sizes of the hominins' molars suggest that it may have undergone island dwarfing, similar to H. floresiensis,  although no estimate of its height is currently possible. The Wallace Line or Wallace's Line is a faunal boundary line drawn in 1859 by the British naturalist Alfred Russel Wallace and named by English biologist Thomas Henry Huxley, that separates the ecozones of Asia and Wallacea, a transitional zone between Asia and Australia. West of the line are found organisms related to Asiatic species; to the east, a mixture of species of Asian and Australian origin is present. Wallace noticed this clear division during his travels through the East Indies in the 19th century. ↑ Technically, they are separated by Huxley's revision of the Wallace Line, which originally was drawn to the east of the Philippines. 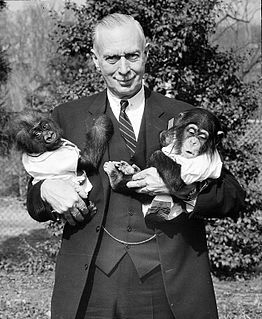 Homininae, also called "African hominids" or "African apes", is a subfamily of Hominidae. It includes two tribes, with their extant as well as extinct species: 1) the Hominini tribe ―and 2) the Gorillini tribe (gorillas). Alternatively, the genus Pan is sometimes considered to belong to its own third tribe, Panini. Homininae comprises all hominids that arose after orangutans split from the line of great apes. The Homininae cladogram has three main branches, which lead to gorillas, and to humans and chimpanzees via the tribe Hominini and subtribes Hominina and Panina. There are two living species of Panina and two living species of gorillas, but only one extant human species. Traces of hypothetical Homo species, including Homo floresiensis and Homo denisova, have been found with dates as recent as 40,000 years ago. Organisms in this subfamily are described as hominine or hominines. Homo floresiensis is an extinct species in the genus Homo. Dmanisi is a town and archaeological site in the Kvemo Kartli region of Georgia approximately 93 km southwest of the nation’s capital Tbilisi in the river valley of Mashavera. The hominin site is dated to 1.8 million years ago. It was the earliest known evidence of hominins outside Africa before stone tools dated to 2.1 million years were discovered in 2018 in Shangchen, China. Swartkrans is a fossil-bearing cave designated as a South African National Heritage Site, located about 32 km (20 mi) from Johannesburg. It is located in the Cradle of Humankind World Heritage Site and is notable for being extremely rich in archaeological material, particularly hominin remains. Fossils discovered in the limestone of Swartkrans include Homo ergaster, Paranthropus and Homo habilis. The oldest deposits present at the site are believed to be between 1.9 and 2.1 million years old. Tabon Man refers to remains discovered in the Tabon Caves in Lipuun Point in Quezon, Palawan in the Philippines. These were discovered by Robert B. Fox, an American anthropologist of the National Museum of the Philippines, on May 28, 1962. These remains, the fossilized fragments of a skull and jawbone of three individuals, were believed to be the earliest human remains known in the Philippines which date back to 16,500 years ago, until a metatarsal from the Callao Man discovered in 2007 was dated in 2010 by uranium-series dating as being 67,000 years old. The Tabon fragments are collectively called "Tabon Man" after the Tabon Cave, the place where they were found on the west coast of Palawan. Tabon Cave appears to be a kind of Stone Age factory, with both finished stone flake tools and waste core flakes having been found at four separate levels in the main chamber. Charcoal left from three assemblages of cooking fires there has been Carbon-14-dated to roughly 7000, 20,000, and 22,000 BCE. Jebel Irhoud is an archaeological site located just north of the locality known as Tlet Ighoud, about 50 km (30 mi) south-east of the city of Safi in Morocco. It is noted for the hominin fossils that have been found there since the site's discovery in 1960. Originally thought to be Neanderthals, the specimens have since been assigned to Homo sapiens and have been dated at 315,000 years old. The Denisovans or Denisova hominins(di-NEE-sə-və) are an extinct species or subspecies of archaic humans in the genus Homo. 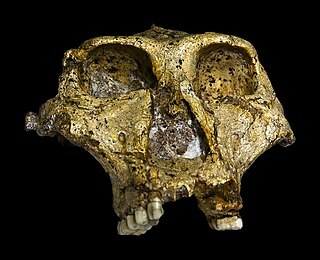 Pending its taxonomic status, it currently carries temporary species or subspecies names Homo denisova, Homo altaiensis, Homo sapiens denisova, or Homo sp. Altai. 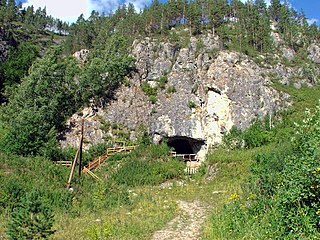 In 2010, scientists announced the discovery of an undated finger bone fragment of a juvenile female found in the Denisova Cave in the Altai Mountains in Siberia, a cave that has also been inhabited by Neanderthals and modern humans. The mitochondrial DNA (mtDNA) of the finger bone showed it to be genetically distinct from Neanderthals and modern humans. The nuclear genome from this specimen suggested that Denisovans shared a common origin with Neanderthals, that they ranged from Siberia to Southeast Asia, and that they lived among and interbred with the ancestors of some modern humans, with about 3% to 5% of the DNA of Melanesians and Aboriginal Australians and around 6% in Papuans deriving from Denisovans. Several additional specimens were subsequently discovered and characterized. The Rising Star cave system is located in the Malmani dolomites, in Bloubank River valley, about 800 meters southwest of Swartkrans, part of the Cradle of Humankind World Heritage Site in South Africa. Recreational caving has occurred there since the 1960s. Fossils found in the cave were, in 2015, proposed to represent a previously unknown extinct species of hominin named Homo naledi. Several expansions of populations of archaic humans out of Africa and throughout Eurasia took place in the course of the Lower Paleolithic, and into the beginning Middle Paleolithic, between about 2.1 million and 0.2 million years ago (Ma). These expansions are collectively dubbed as Out of Africa I, in contrast to the expansion of Homo sapiens (anatomically modern humans) into Eurasia, which may have begun shortly after 0.2 million years ago. Rhinoceros philippinensis is a Pleistocene-aged species of rhinoceros endemic to the Philippine islands. Fossil remains have been found in modern day Metro Manila and Kalinga. 1 2 3 4 Détroit, F.; Mijares, A. S.; Corny, J.; Daver, G.; Zanolli, C.; Dizon, E.; Robles, E.; Grün, R. & Piper, P. J. (2019). "A new species of Homo from the Late Pleistocene of the Philippines". Nature. 568 (7751): 181–186. doi:10.1038/s41586-019-1067-9. ↑ Grün, Rainer; Eggins, Stephen; Kinsley, Leslie; Moseley, Hannah & Sambridge, Malcolm (December 2014). "Laser ablation U-series analysis of fossil bones and teeth". Palaeogeography, Palaeoclimatology, Palaeoecology. 416: 150–167. doi:10.1016/j.palaeo.2014.07.023. ↑ Zimmer, Carl (April 10, 2019). "A New Human Species Once Lived in This Philippine Cave – Archaeologists in Luzon Island have turned up the bones of a distantly related species, Homo luzonensis, further expanding the human family tree". The New York Times . Retrieved April 10, 2019. 1 2 Wade, L. (April 10, 2019). "New species of ancient human unearthed in the Philippines". Science. 364. doi:10.1126/science.aax6501. ↑ Manalo, Kathryn 2011. Preliminary Identification of Cut Mark Morphology on Animal Bones: Methods & Applications. Master Thesis, University of the Philippines Diliman. ↑ Ingicco, T.; van den Bergh, G. D.; Jago-on, C.; Bahain, J.-J. ; Chacón, M. G.; Amano, N.; Forestier, H.; King, C.; Manalo, K.; Nomade, S.; Pereira, A.; Reyes, M. C.; Sémah, A.-M.; Shao, Q.; Voinchet, P.; Falguères, C.; Albers, P. C. H.; Lising, M.; Lyras, G.; Yurnaldi, D.; Rochette, P.; Bautista, A. & de Vos, J. (2018). "Earliest known hominin activity in the Philippines by 709 thousand years ago". Nature. 557 (7704): 233–237. doi:10.1038/s41586-018-0072-8.